"woe to the lady who would enter such a room in a dress that was not artistically suitable." As Karl Ernst Osthaus implies, it is important to consider the venue when choosing what to wear to an event. You must be dressed appropriately for your surroundings. 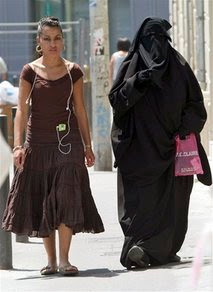 This brings up the issue of women who usually wear a niqab/abaya/hijab in their own country but when they leave on vacation they remove their modest clothing in order to fit in more in their, usually Western destination. Wearing the hijab or niqab in the Western world does draw attention to them and attract stares by men and women so, to some extend, the intention of being modest is compromised. Some women prefer to not be starred at like an alien and feel that it defeats the purpose of wearing the hijab. How do you feel about being starred at when traveling to non-Islamic countries? Do you feel your privacy is compromised?